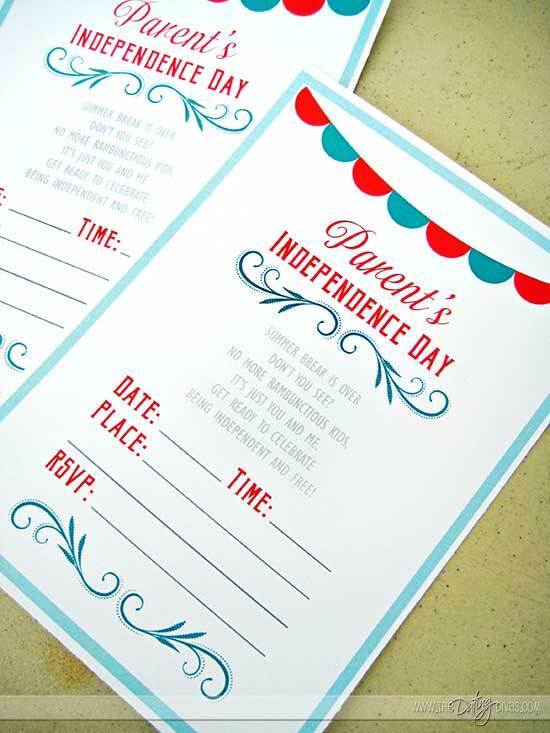 Send the Kids off to School and Celebrate a Parent’s Independence Day Party!!!! Summer break is over, the first day of school has arrived, and it’s time for the parents to par-tay!!!! We all love our kiddos but that first day of school is worth celebrating. Send the kids off to their first day of school in style! Shoo the kids out the door, grab your best group of friends together, and have a back-to-school lunch date! It’s time to celebrate being independent and free! 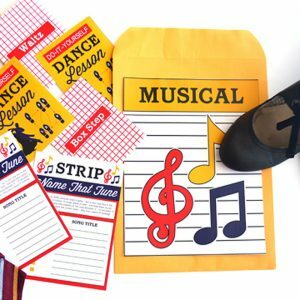 This isn’t just any normal lunch time party, this is an upscale lunch party with an adult twist on a kid school theme. 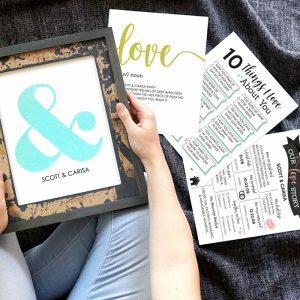 This date couldn’t be pulled off without these fabulous printables! A huge thank you to Strawberry Mommycakes for designing these. 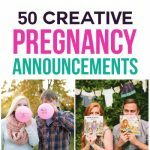 Take a peek at her page and tell her thank you! 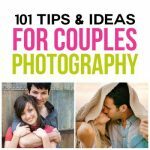 We thought of everything you’ll need to pull off the best lunch party date ever!!! A great party is only as great as the people you invite. So make a list of your favorite parents and send them an invite. Schedule the lunch date party on the first day of school. 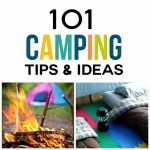 All the parents can play hookie or schedule their lunch hour around your back to school party. If you want to go paperless, send a digital invite, use an editing program to input your information. 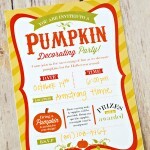 Send the invites out by email, create a facebook event, or use an e-vite service. I personally love saving money and time by going the paperless route! What’s for lunch? A grown-up menu with a sack lunch twist! Sweet potatoes covered in a crispy cornmeal and herb mixture. Lemonade soda infused with berries. Assorted sweets to celebrate our independence! 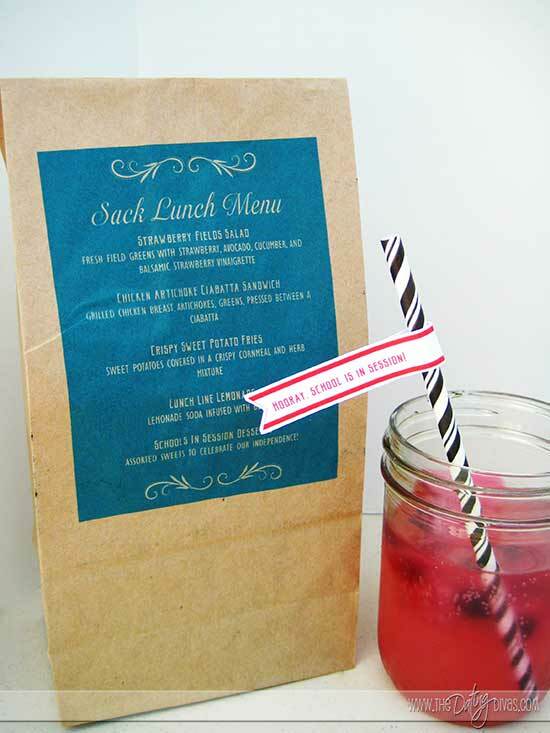 You have several options when it comes to your sack lunch menu. 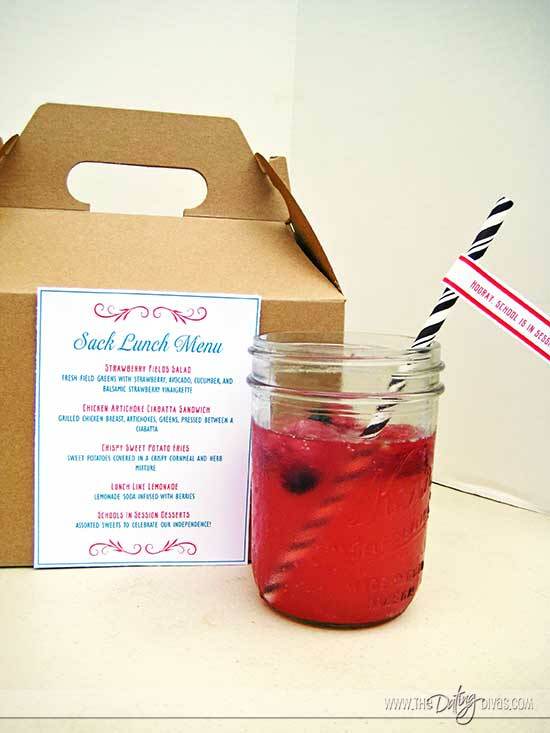 Choose from a printable to glue onto your sack, a blank printable menu so you can create your own lunch, or a menu that you print directly onto your sack, how awesome is that?! Use page 5 to print onto the lunch bag. Our printable is sized perfectly for your regular sized brown sack paper lunch bag . Head on over to this tutorial to learn how to print easily onto the lunch sack. Decisions, decisions!!!! I’m torn! I love the cute grown up lunch box yet I’m digging printing directly onto the bag because it saves soo much time. Decisions, decisions!!! Pick the printable that works best for your party. You can’t have a party with out the flags!!! 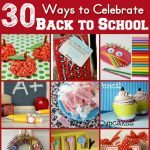 These “Hooray School Is in Session Flags” add the perfect finishing touch to your festive paper straws or pencils for this party. You can’t have a party without dessert! I know it’s lunch time, but this is an adult party, you can do whatever you want!!!! We’re celebrating, remember? Don’t skimp on those treats! 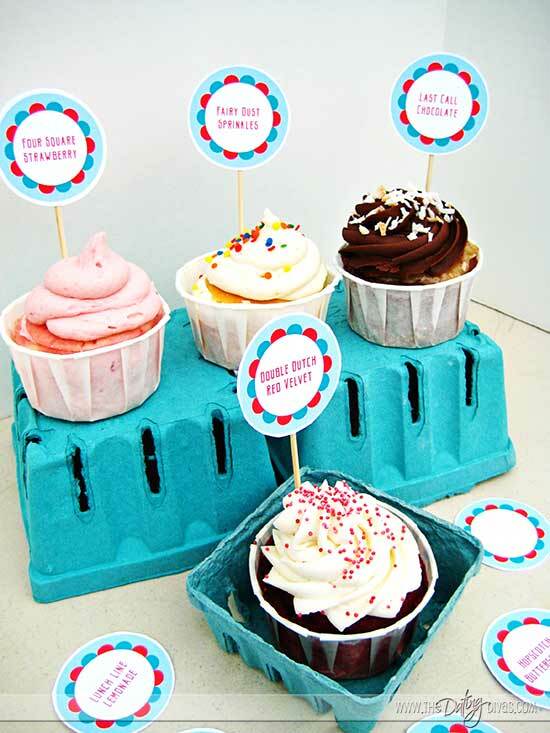 Pick your favorite dessert and use these toppers. Did you notice how each title is a cute school theme?! So much fun! There are 7 toppers with clever titles and 5 blank toppers. Whatever dessert you choose, we’ve got the topping that’s perfect for you! You can’t have a back to school party without an exam! 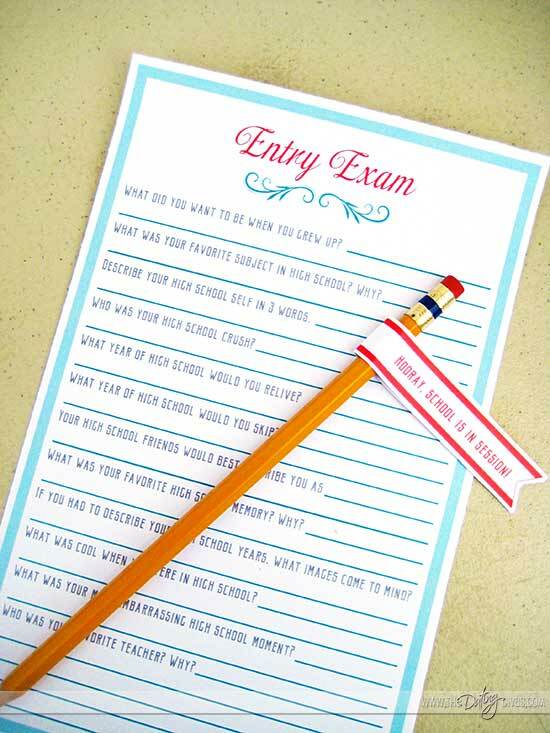 Seriously, your guests are going to love this exam because it’s a throwback to their good ol’ school days! Who was your high school crush? What did you want to be when you grow up? What was your most embarrassing high school moment? And the list goes on. Hand out the pre-sharpened #2 pencils , start the timers, and get to work on completing that back to school entry exam! Give each person a chance to read over their questions. You could have each person read their own answers or mix up the exams, read the answers and see if the guests can match the correct answers with the correct guest. This entry exam would be a perfect ice breaker game. Don’t let your guests leave the party empty handed. Send them home with School Day Hall Passes! 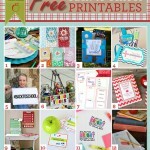 These printables come with an envelope and 21 coupons. What’s so great about these coupons? You know those busy days when you have to help the kids with homework, put lunches together, and carpool all the kids? Sometimes parents just need a break from the hustle and bustle of the school year. 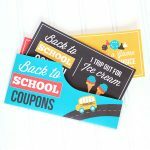 These coupons are going to give one parent a pass on whatever activity they choose, keep them sane, and get them through the school year! 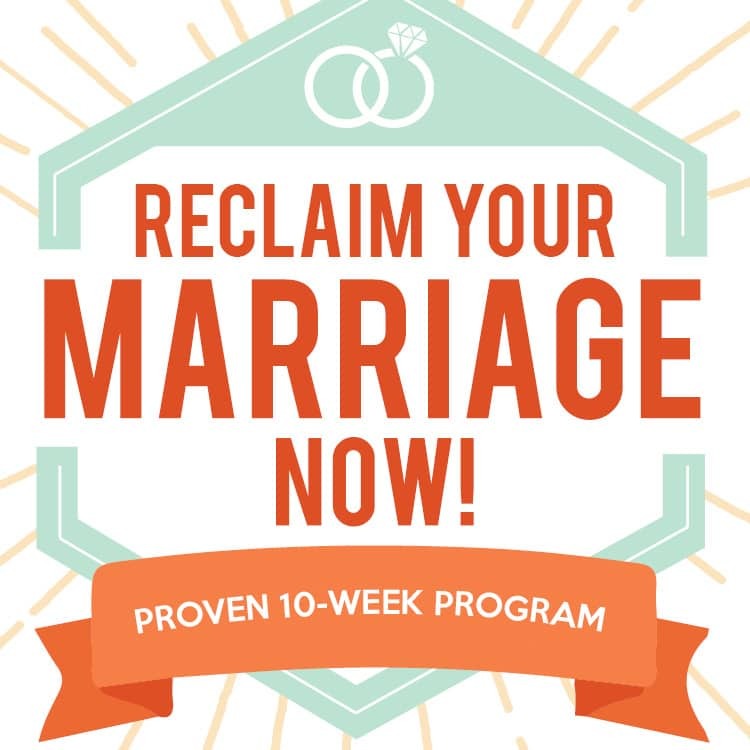 Choose to either give each couple an envelope full of coupons or give one to each guest. If you hand out one coupon per couple, they must take turns using the coupons. If you hand out one per parent, they can decide the rules they’ll play by. Maybe you want to give these to your guests, but you don’t want to print out all of these copies. I’ve got a solution for you! At the end of the night send them home with a thank-you note, encouraging them to check their email for a thank-you gift that includes their digital copy of the envelope and coupons. 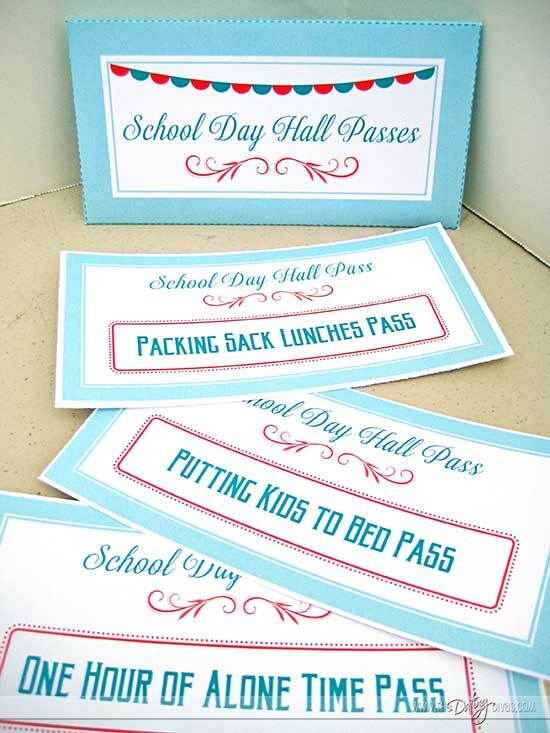 If you’re a parent, you know that there is always an occasion to use a hall pass!!! We know your kids are going to be jealous of your grown-up back to school party! 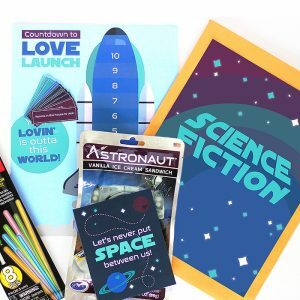 We've got a few ideas to make them happy too, check out 12 Free Back To School Printables, 30+ Ways To Celebrate Back To School, Back to School Family Dinner Date, and 25 Fun First Day Of School Traditions. I love anything that sparkles, everything dealing with love, warm summer rays, and my hot hubby. I find balance in life by staying physically fit and keeping it real. My purpose in life is cherishing my marriage and making our adventure shine!